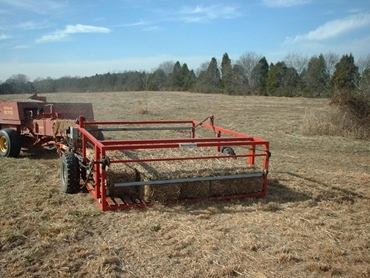 The Steffen Systems model 1550 bale accumulator is a machine built to tow directly behind the baler to create tight, uniform packages of 15 bales. Its precise functions will keep up with any baler’s production. The hydraulics simply plug into the tractor, no need for extra pumps. The bales are pulled away from the baler automatically so the bales won’t jam. The dump system is matched to ground speed so each package is dropped without spreading. There are no tipping tables to let the operator down . The Steffen Systems model 1550 bale accumulator is specifically made for packaging 15 bales together to form a tight package measuring 2.4 meters x 2.4 meters(3x5) ready to load directly onto a truck using the Tenpack Fifteen Bale Grab. This completely eliminates the need for someone to stack bales on the truck to get a full load. Also, it eliminates the need to hand stack at the shed, and hand load out at a later date. This is the system to eliminate all manual handling, and the need for anybody to work at dangerous heights. Connecting the bale accumulator to the baler is made easy by using a simple bolt-on hitch that connects to the rear of the bale chamber. This allows the bale accumulator to be unhooked away from the baler in about 2 minutes (if required). The bale accumulator transports easily behind the baler.